Now loyal, patient friends, I will tell you in more personal words than you will read in my artist’s statement, what this work is all about, how and why I made it, and why I can’t wait to make more. Portraits, faces, and captured gestures fascinate me. I’d love to have the power to pause time and to really understand what I am seeing or witnessing in the face of another. Naturally, what I may glimpse in a passing gesture or expression runs through my filter and I come away with an impression of an expression. While that process works well enough for most of us, I often wonder just how similar our perceptions are. I delight in reading expressions. Conversely, I sometimes wonder about the sincerity of an expression. I find micro expressions captivating. I am equally enamored with technology that plays with our perceptions. particularly technology that broadens the opportunities for artists. I love my digital camera, computer and my Wacom tablet. These tools help me capture expression in a most immediate and gratifying way. However, I also recognize that the old-fashioned, traditional methods of working feed my need for personal expression in a more intrinsic fashion. Strange as it may seem, I have also been thinking about fabric. It is the first and last “material” in the world that literally touches us. We spend time and dollars searching for garments, home furnishings and bedding that are to are liking. Fabric literally hides us. Fabric is loaded iconography. I ask a portrait subject to pose for a portrait, and to use the fabric I give them in any way they choose. I digitally photograph the subject in between “poses”, while the subject is thinking about what to do next with the prop, or before they settle into a new pose. These resulting images become reference for a traditionally painted oil portrait. I employ the digital camera again to take photos of the completed oil painting, and then print these photos onto silk fabric. 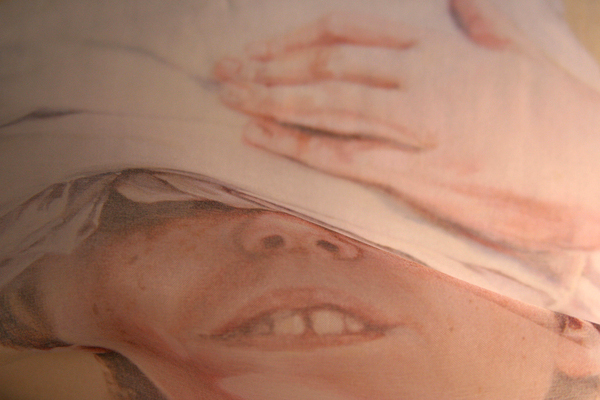 I manipulate the fabric to present various new isolated expressions and distortions of the subject’s expression. I digitally photograph these manipulations. The work finally culminates in large-scale prints of re-arranged expression. I must add here that I do get permission to manipulate the portraits, but the subjects do not know what will happen to their images before the shoot. Everybody to date has allowed me to proceed with wonderful good humor. Thank you to my subjects. And thank you to you for your interest and your comments about the project. I have many more portraits in the works and look forward to sharing them with you. Aha! Was dying to know! Thanks- really like the ‘iconic’ treatment of fabric, very profound! How interesting. I love the concept and how you have woven your passions together. At first glance, the viewer knows that something unusual and meaningful is going on and can’t help but wonder what it is. Thank you for revealing the mystery! Very interesting concept. I like the idea of taking the things that you are attracted to and that fascinate you, & combining them in some way. The older I get, the more I want to explore what I need to understand.